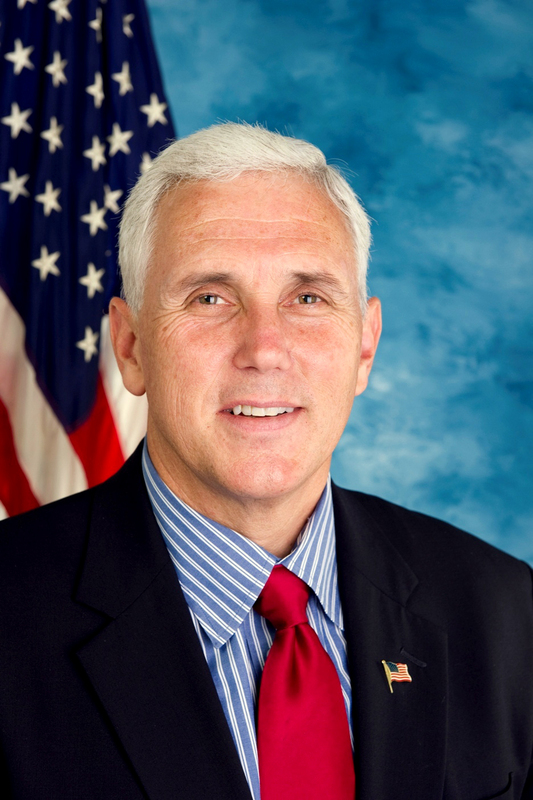 Ogden on Politics: The Pence Re-Election Dilemma: "What About Donald?" The Pence Re-Election Dilemma: "What About Donald?" A recent poll shows Republican Gov. Mike Pence with a slight 4 point lead (well within the margin of error) in the Governor's race over Democrat John Gregg. Democrats are celebrating the closeness of the poll. They shouldn't be. After all the fire the shots Pence has taken during his tenure, and the constant unflattering media coverage, Gregg should be ahead. Now we're moving into the paid media stage of the campaign which is likely to be more favorable to Pence. The Governor should be able to polish and improve his image with plenty of 30 second spots touting his economic record and leadership. That's the good news for Republicans. The bad news is that Gregg has an ace card up his sleeve, the GOP candidate who will be at the top of the ticket, Donald Trump. During the Indiana Republican primary, Pence walked a fine line endorsing traditional conservative Texas Senator Ted Cruz while also praising Donald Trump for bringing certain issues to the forefront. Pence successfully straddled the fence, managing to make neither side angry in the contentious primary. Now moving into the general election the "What About Donald" question becomes much more problematic for Pence. If Pence distances himself from the controversial GOP nominee, he is likely to anger the Indiana Tea Party crowd which has fully (and strangely) enthusiastically embraced the liberal New York businessman. Pence is not popular with the Tea Party and fully supporting Trump would shore up support among a constituency that is critical to his base of support. But embracing "The Donald" carries enormous risk. Trump has insulted women and Latinos, and is extremely unpopular with those two groups. Trump's womanizing makes Bill Clinton's look like a rank amateur. His mafia ties have also been exposed. Trump has mocked a disabled reporter and encouraged violence at his rallies. Imagine every day on the campaign trail Pence being asked whether he agrees with a controversial thing that Trump said or did and whether the Indiana Governor still supports the GOP candidate. Trump thus far has been able to escape being held responsible for his words and deeds. But Pence enjoys no such Trump Teflon. He is likely to be tarnished with the fallout from "The Donald." It won't help any that Indiana likely will be a general election battleground in the presidential contest. The Pence campaign faces a dilemma in figuring out how to deal with the Donald problem. It seems like either choice will cost Pence votes. The politics on The Donald's nomination is so unbelievably easy for Republicans that I can scarcely believe the amount of consternation. Any establishment Republican can point to the alternative and honestly say, "Of all of our fantastic candidates for president this election cycle, I might not perhaps have chosen Trump, but given the alternative, and the damage that would be visited on this country if Hillary is elected, I am happy to give Trump my full support this November." They don't have to buy into a Trump presidency, they simply have to prefer it over a Hillary one. Why is this hard? You don't have to be "establishment" to oppose someone representing the party of Lincoln and Reagan who is a big government liberal, someone who insults women and minorities, someone who is a major womanizer and has mafia ties, someone who has been involved in one scam after another, someone who doesn't understand foreign or domestic policy (or care to), and someone who is completely unqualified and unfit for the Office of the Presidency. That someone, of course, is one individual: Donald J. Trump. It is 1964 all over again. Goldwater drove black voters to voting with the Democratic Party. We've never got black voters back after that.. Trump will drive Latinos to vote Democratic. We will never recover from that. Those of us Republicans who fail to stand up for the principles of the party will be forever tarnished by the Trump candidacy. And for all of that, he is still a better candidate than Hillary. (And just picking nits here, but you write "big government liberal" as though that somehow distinguishes him from the GOP of the last twenty years). Karl, I certainly don't think he's a better "candidate" than Hillary Clinton. He's polled consistently the worst of all the potential GOP matchups with HRC. He's behind in most head-to-head matchups at the national level and in the key state-to-state matchups he's losing or on the verge of losing several traditional Republican states while winning virtually none of the traditional Democratic states he's bragged that he will be competitive in. Instead of "candidate" think you're suggesting he would be a better President than Hillary. I don't buy that either. You know Trump's temperament. Do you really want him meeting and negotiating with world leaders or having his finger on the nuclear button? I sure don't. He's likely to get us into WW III over some personal slight he suffered. I don't like Hillary but she clearly has a better temperament for the position and better judgment than Trump. Not to mention, I don't think she's mentally imbalanced while the jury on that issue is out on Trump. Then we have the fact that Trump has already threatened to use the institutions of government to go after political critics. That is unacceptable. I believe in free speech and the unfettered right to riticize our leaders. Trump does not believe in that as also evidenced by his assertion that he will change the libel laws to allow people to be more easily sued when they criticize public figures. Bottom lin is that no matter how much I dislike Hillary Clinton, I love my country too much to vote for a person, Trump, who is completely unfit and unqualified for the Office of the Presidency. It truly astounds me how different the opinions are on Mr. Trump. I can only account for it by suggesting that he has shown many different sides of himself personally and politically that he has provided a lot of reasons to support him and a lot of reasons not to. It appars that people are focusing on what they want and choose to see in him. For one, I see more good than bad. More positive than negative. If given a chance, I think he will impress many of his naysayers that quite simply are jealous, judgmental or condescending. June, July, August, September, October....seems like long enough time for Paul to be thrown from his hobby horse or for Trump to regrow his horns and pointy tail. You don't succeed at building skyscrapers without handling / managing risk. Few of Trump's critics & damn few of his competitors have any experience with that level of risk. The idea that he can't manage aspects of the Presidency when his experience & success have been leveraged on exactly the ability to delegate- is preposterous. Bringing the discussion back to IN's gubernatorial race; the top of the ticket will have a carry effect for those considered not PC. Hillary has been politically sheltered from the realities of competition; not Trump. People are fed up with the statist fraud & cultural molestation of political "correctness." Pete, if you've followed Trump's career it is one of always playing with other people's money. He's, of course, had four bankruptcies and numerous business failures. The man inherited $100 million and I doubt he has any more money today than he would have if he had invested that $100 million at 6% interest. The reason why Trump won't disclose his tax returns is the public will learn that the supposed $10 billion man shows virtually no income and pays less taxes than you and I.
I won't give up my soul to cast my vote for someone completely unfit for the Office of President. Paul: Not versed or sure about the $110M figure, but that doesn't make him guilty of anything. While unfortunate, bankruptcy's a provisional alternative within our law to debtor's prisons; encouraging people to take risks & grow the private sector. Idling $100M at savings interest might seem safe, but discomfort for a risk taker; risk being essential to living. The law allows for wealthy folks to direct their income & minimize liabilities- that doesn't make him guilty of anything either. Any why should anyone volunteer their returns? It's a goofy practice that ignores sovereignty & sets the stage for coercion. There's nothing sacrosanct about our tax system; quite the opposite. Trump's more worker bee than coaster; which is admirable. Again, most or 95% plus, are not familiar with the level of risk involved in building a skyscraper; which must be done with precision & care. Trump's also a patriot who loves America & the ideal it represents. Trump is the perfect representative for the GOP, he's an old white racist only looking out for himself. Pete, if you follow Trump's career it is always other people's money at risk, not his own. He is constantly walking away from his financial obligations to his workers and to people who are foolish enough to lend him money. Would a "patriot" refuse to hire the 300 or so local AMERICANS who applied for jobs at the Margo Lago resort in favor of shipping in foreigners to take those jobs? This is also a guy who claims to want American products made in America, then he has his own products made overseas by foreign workers. I couldn't disagree with you any more regarding your suggestion that Trump is a patriot. Donald Trump is a two bit con artist. His entire career is one con after another. His latest venture into politics, is yet another one. Here is a lifelong liberal Democrat convincing a bunch of conservatives that he's changed his mind on an assortment of positions. Then, once he secures the nomination, he then says those were merely "suggestions." Yep, another Donald Trump con. http://newsbusters.org/blogs/nb/tim-graham/2016/05/22/washpost-buries-their-own-poll-result-trump-leads-clinton-46-44 It is only a poll and so hardly worth reading but if you get your information from Indy Star Gannett/WAPO you have to know that if it doesn't like the news it will suppress it. It will lie to you by omission.....it is good at it and most readers don't have time to double check their lyings. Paul: You're correct that Trump's changed his position on several issues; from which he can't easily retreat. American unions & labor laws are hostile to the employment of our citizens- that needs to change. In the late 1980's when I first read Trump's book; I didn't care for him but thought he loved the country as a patriot. For me he's an acquired taste, but he's serious about the country & its better prospects.